I'd probably choose one of the birthday themes for my daughter's upcoming 9th birthday. My little boy loves guitars so he would totally LOVE the "You So Rock" fruit roll-ups. I like the cupid Valentine's one the best. Very cute and clever idea they came up with. This is so fun. My mom never bought fruit roll ups for us when we were little, but I'd somehow get lucky and have a friend trade with me for something else. I like the "happy birthday" and think it would be funny to give these out for my husband's birthday. I also like "I love you." I'd probably design something of my own though. Thanks for the chance! I'm a class mom, we have my son's Valentines Party coming up, so one of the Valentine themes would work. My son's asleep or I'd have him choose! Thanks for this cool giveaway, I;d love to win, the class would really enjoy these treats. Since Valentines Day is coming up, I have to choose Valentines Hearts for my design. I'm trying to plan a small valentines day surprise party, so this would just be an awesome gift! I like the Birthday 1 design. My little twins have a birthday coming up so this would be great for them! I would choose the Valentines day hearts. This would be perfect for my students at school! I would use their hooked on you design and add my daughters picture for Valentines day! Thanks for a cute giveaway!! valentine 2x2 i'm hooked on you. I love the You So Rock ones! love the birthday theme. my little girl is turning one next month. will have to order some for her party with her PICTURE on it. love that. My fave design is Birthday 1. I like the Valentine Hearts design. My daughter makes googy bags for her teachers and friends at scholl and these would be great. Love the Valentines hearts Fruit Roll-Ups. These are so adorable. My daughter would LOVE these! So cute!! I love the Cupid design. 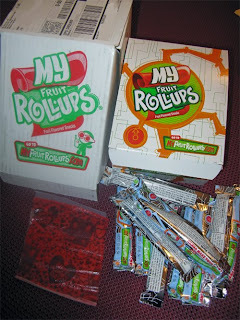 We eat Fruit Roll-Ups here often so this would be perfect and so much fun. Thank you!! I would go with the princess theme for my granddaughters birthday. Thank you so much! The Valentines' for my daughter's class! I love Valentine's day hearts 2. I would use the valentines hearts templet and add a photo of our foster dog. I would use these at our annual upcoming fundraiser. I would be ordering a graduation theme with my daughter's senior picture. Even though she thinks it is freaky for people to EAT HER FACE! I like the Valentine's Hearts! So cute! The Valentine one would be great to give to my son's little friends! I really like the cupcake ones for my daughters birthday. katie_mmartin at yahoo dot com. I'd get the 3x3 one with a pic of my daughter, a birthday graphic, and a birthday message from her. I'd use them as party favors for her March birthday. I like the first Valentine hearts design. Thank you!! I love the pirate design; aargh! I would choose the design your own 3x3 & put my youngest 3 kids' pics on them. I'd use the birthday 1 design to create some for my daughter's upcoming birthday party. Thanks. I love the Birthday safari theme. Very cute! I'm a subscriber via reader. I like the valentines hearts... a nice simple design but cute as well! i like that the template looks uncluttered as well. I kind of like Birthday 1. I like the first birthday design. Whenever we have fruit roll ups in the house, I always tell hubby not to eat them, they're for the kids' lunches. So, I would LOVE to make the Valentine's Day heart design, with a picture of my 3 boys, and let the boys give Daddy fruit roll ups for Valentine's Day!! I'm subscribed to your feed!!! I just saw someone with these at a superbowl party earlier today!!! I didn't know you could put a picture on them though! Awesome!! I like the birthday balloon desgins, my grandson's birthday is coming up soon, he'll be 4, I'd love to add a pic of him and I for his birthday!